The Year 1 children have settled well into their classes. We have started the half term establishing routines and introducing the new curriculum. Year 1 began their Autumn 1 half term with an Explosion into Topic Day around this half term's topic of Old and New Toys. 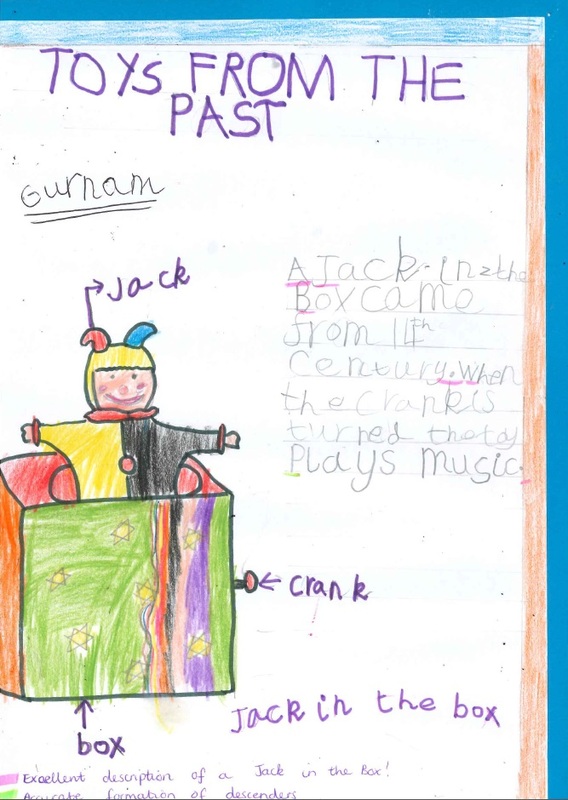 The children had the chance to make marionettes, jack in the boxes, thaumatropes and dolly peg dolls. 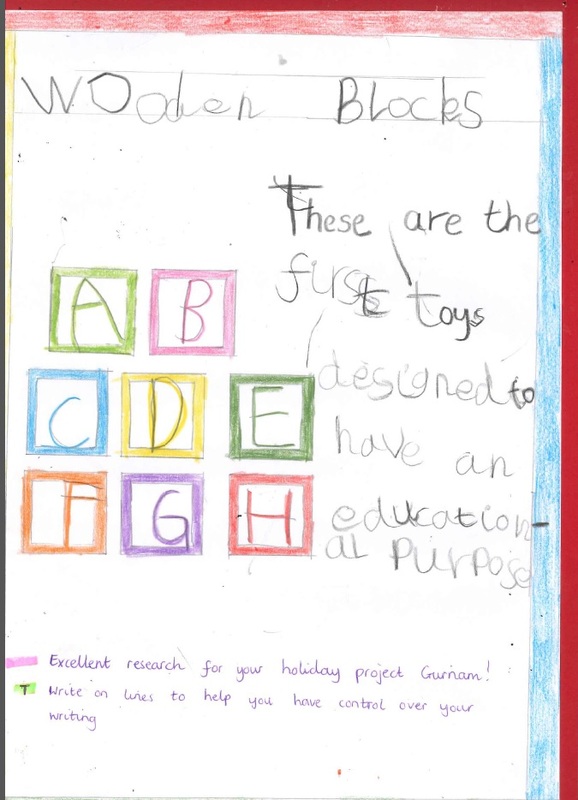 The children were also given the opportunity to share their lovely Toys from The Past Holiday Projects which they had been working hard on over the summer holiday. We have started the year off in Mathematics working on our fluency in Place Value. 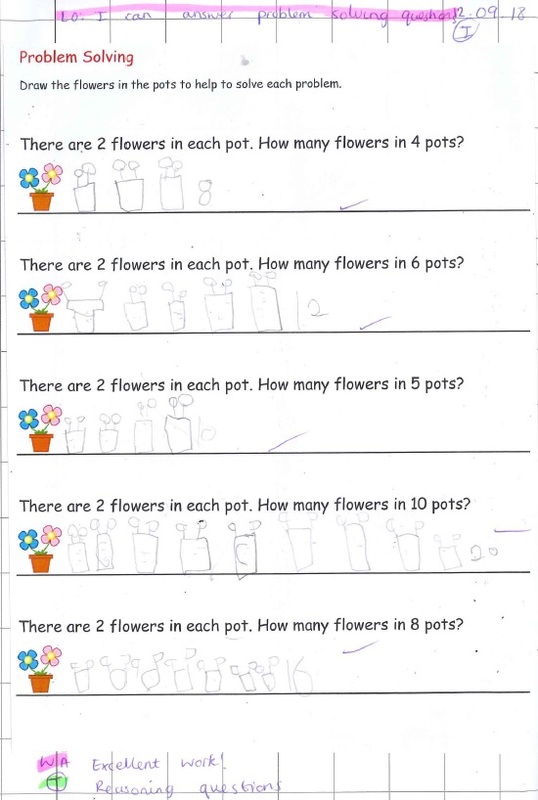 The majority of the children are now confident with counting forwards and backwards to 20 and have been able to answer reasoning and problem solving questions. 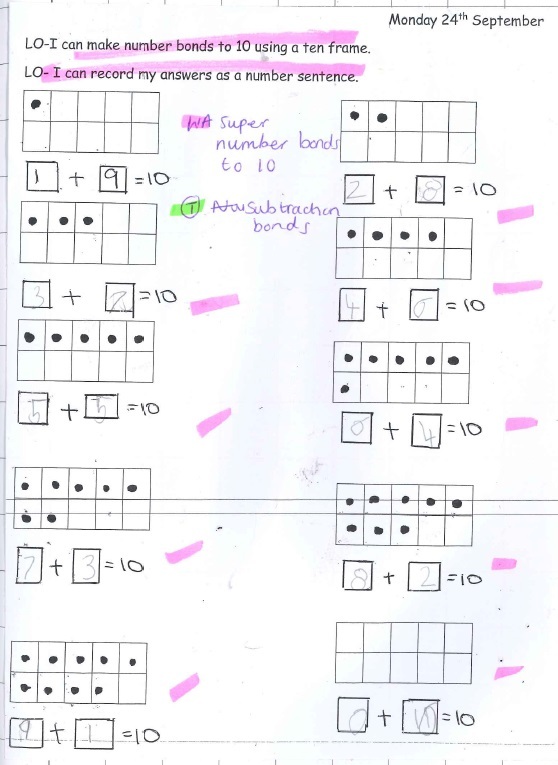 The Year 1 children have been representing the number bonds to 10 in different ways including using a tens frame, the part whole model and writing number sentences. Thank you to everyone who attended Year 1's Reading and Phonics Workshop on Tuesday 2nd October 2018. We are very pleased to have had an excellent turnout and positive feedback from those who attended. We hope that you were able to gain a deeper understanding of how and why Phonics and Guided Reading is taught in Year 1. Each child was given a copy of the Powerpoint from the Workshop to take home which includes different styles of questioning which parents can use when reading at home. 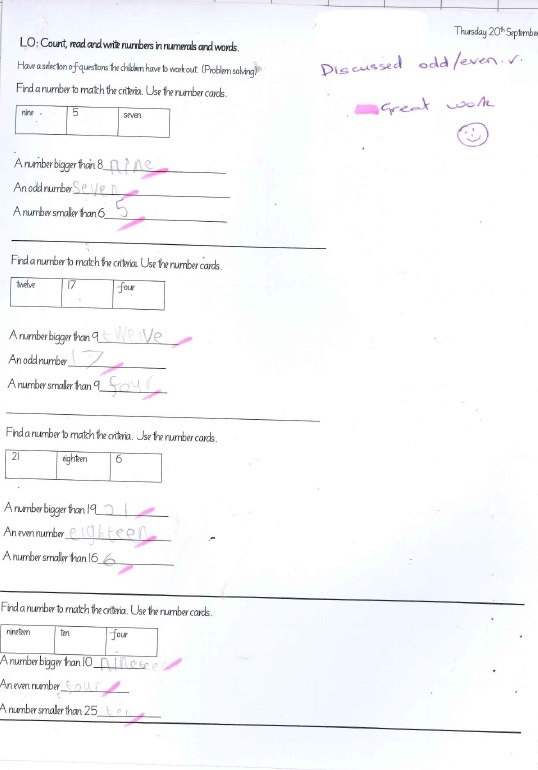 If you did not recieve this, or need another copy, please ask your child's class teacher. On the Wednesday 10th October and Thursday 11th October Year 1 went on their first educational visit of the year to Weston Park in Shropshire. 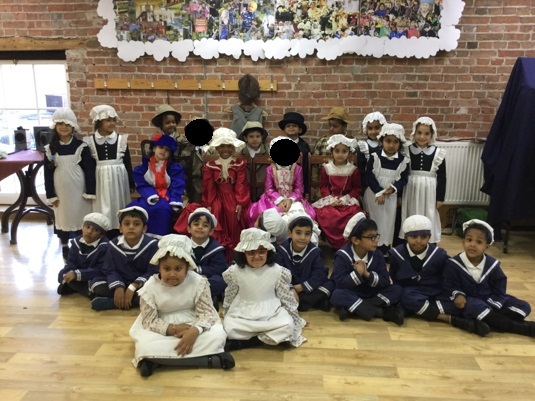 The children behaved exceptionally well and represented the school proudly. 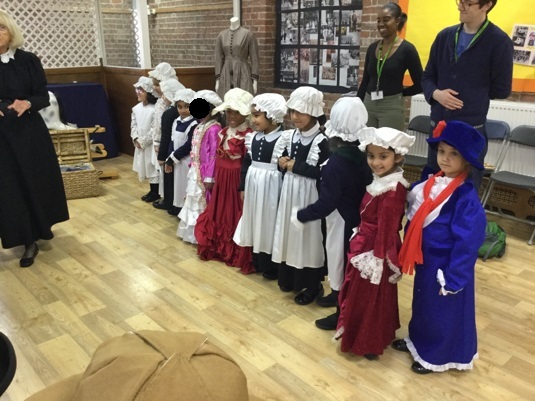 The children enjoyed learning about Victorian school life and trying on some of the clothes. In addition the children got the opportunity to explore and play with indoor and outdoor Victorian toys. In the final week of Autumn 1 all children who had recieved 100% attendance for the entire half term were entered into a raffle. Two winners from each class were chosen to travel into Birmingham City Centre to the Build A Bear workshop to choose a new addition for their classes. The remaining children in school with 100% attendance were given the opportunity to play with brand new board games for the afternoon. Well done to all those children who came to school everyday in the first half term! Please continue to encourage your child to come to school everyday in Autumn 2. Year 1 started their Autumn 2 literacy lessons exploring and researching their new author of the half term, Jill Murphy. The children have enjoyed reading her books and using iPads and different resources to research the author. The children have been creating informative book reviews and redesigning their own book covers and blurbs for the books they have read by Jilly Murphy. 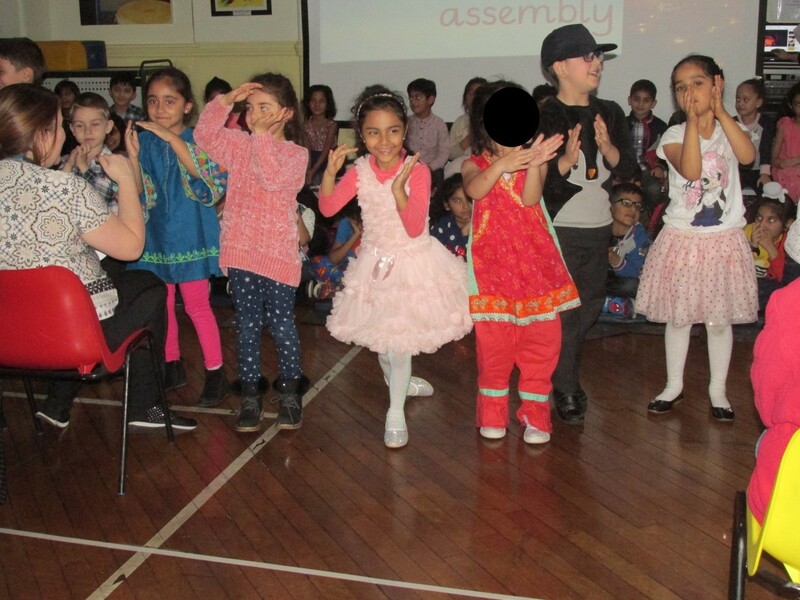 Year 1 were delighted when they had opportunity to share what they had been learning to parents through a Diwali assembly. 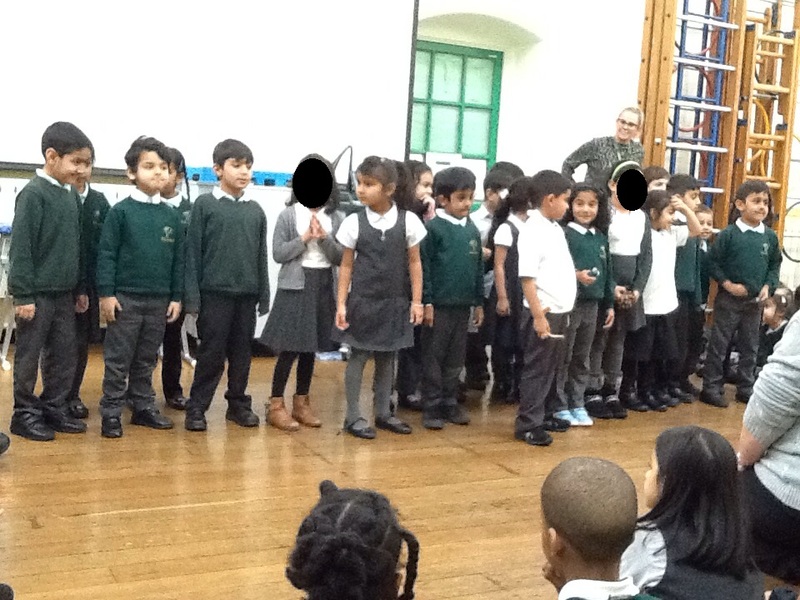 The children had practised extremely hard to use their big clear voices and were very excited about their first assembly of the year. The children shared rangoli patterns and latterns they had decorated, as well as beautifully sang Diwali songs. The children were extremely excited to go on their second trip of the year to the Hindu Temple, which linked to their Autumn 2 topic of Hinduism. Year 1 were lucky enough to have the experience of being guided around the Shri Vekateswara in Oldbury. The children were very respectful during their visit and listened very well. The children were full of questions for their guide. This half term Year 1 have been looking at artwork created by the artist Edvard Munch. We have been talking about the foreground and background within different pieces of art. Year 1 have enjoyed recreating his famous Winter, 1899 piece using oil pastels and chalk to create the different elements within the background and the foreground. 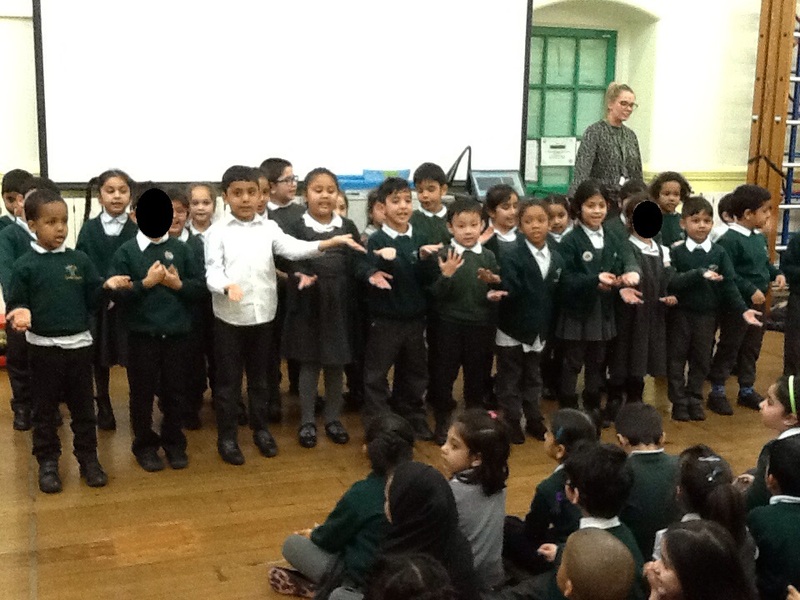 To finish off the half term both Year 1 and Year 2 classes were very eager and excited to share the Christmas song they had been practising in class with the Key Stage. Both year groups gathered for a Christmas Music Festival and each class sang beautifully. Year 1 were welcomed back to school in January after a well deserved break with a Terry Frost Explosion into Topic Day. The children were very excited to hear all about our artist of the half term Terry Frost. The children spent the day exploring how to recreate Frost's famous Suns and Boats piece and his Sunburst piece using different mediums including chalk, paint, card, tissue paper, wax crayons, oil pastels and pencil crayons. In assemblies this week the teachers have been sharing their favourite books from their childhood. On Friday the children also brought in their favourite book to share with the class. A lot fo the children brought in their shiny new books from the Parent's Evening book fair. To end the theme of the week, on Friday 1st February 2019 each Year 1 class went into the Nursery Rainbow room to meet our latest arrivals at Grove School. The children were able to experience nine newly born chicks. In Year 1 we had a very exciting day when a scientist visited us to help the children to learn about floating and sinking. This was a very enjoyable experience and the children learned about the types of materials to use when they created their own boats and about the shape the materials needed to be. They experimented wth different shapes and sizes of materials and they explored adding weights to the boats to see how it would float under pressure. The children used what they had learned from the Hands on Science visit and the investigations they had participated in during their science lessons to make their own boats. They knew the types of materials that would float and they experimented with ways to join the materials to maximise its ability to float under pressure. The concentration and team skills the children used while building their boats was incredible. They encouraged each other and shared their joy when witnessing their boats floating, however long they floated for. Thank you to all of the adults that attended our reading and phonics workshop. Your support and encouragement for you children is greatly appreciated. The children love sharing part of their school day with you and they are very proud to show you how clever they are. The children love listenting to and joining in with poems and rhymes. We have a new poet and a poem every term and this term we have been learning the poem 'Please!' by June Crebbin. This has been a very enjoyable poem and the children have enjoyed putting actions to it. Not only The Greatest Fairytale Ever Told, but also "The best day ever!" according to the children. We had a show-stopping performance from the Hobgoblin Theatre who amazed each and every one of us with their brilliantly written, mixed up fairytale stories. 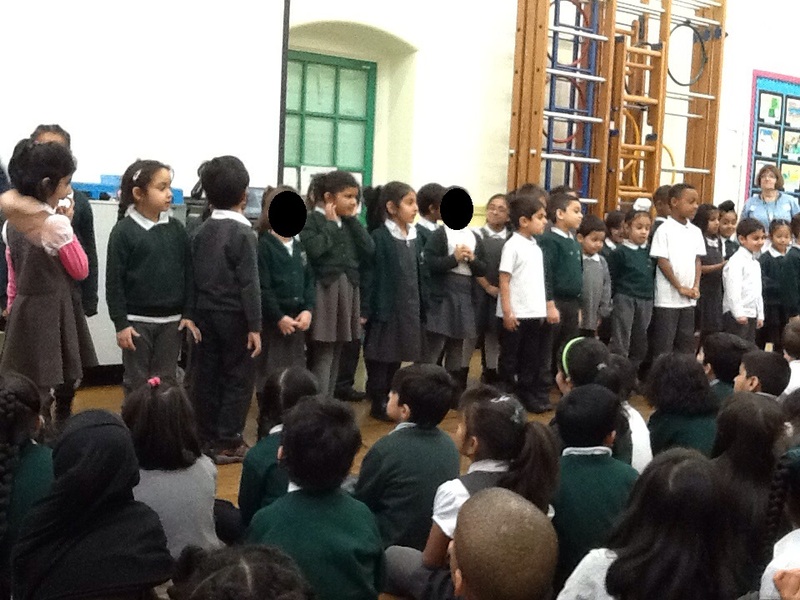 Year 1 took part in a drama workshop after the performance. The children were taught to show expression through facial movements and body movements. They pretended to be trees and flowers in a lovely calming forest, as well as in a scary, dark forest. We have some budding actors among us!